I somehow missed this branch of the Elephant Six Collective even though they apparently record in my neighborhood! They're not as experimental as some of their E6 brethren, but they make pleasant enough music. 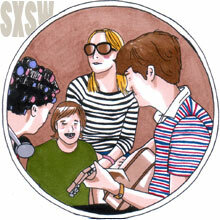 Gary Olson's voice is reminiscent of Jonathan Richman, especially on "NY - San Anton." The country-western guitar and trumpet are nice touches. "Terry" would fit seamlessly on Nightmare of You's Infomaniac. I'd like to check out some of their albums to see if they have a more definitive sound. If you buy an annual Daytrotter membership, you'll get access to their mobile app, allowing you to stream any session wherever you are.